College visits are some of the most exciting opportunities for high school students and parents during their search for the right school. Being on-campus lets you decide the factors that matter to you in a college. College visits can help you in the admissions and application process. Trips to campus give parents the chance to support their students in the college search. Which colleges should you visit? How should you spend your time during the trip and at each campus? Which activities—such as a university tour, info session, or class visit—will help in your decision? What can you do during campus visits to assist in your admissions application? In addition to the above, trip planners have to consider factors such as booking flights, hotels, and car rentals. Parents may have concerns about the role that they should play during visits and ways that they can support their students. Resources for answering these questions are not always available. 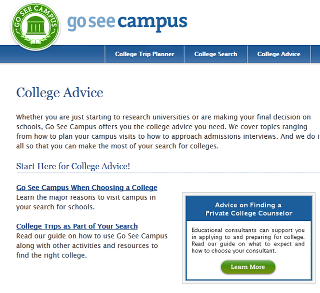 How Go See Campus Helps: We offer extensive free resources to students and parents for learning about college visits. Go See Campus provides resources, books, and travel gear to help you get the most from trips. Why it’s a challenge: Each college is unique in its history, culture, academics, and setting, and many of their websites reflect this identity. When you are planning college visits, however, this can present a problem. You want to find the important information about visiting campus. This means navigating the college’s website, digging into its admissions page, and ultimately uncovering the part that deals with campus visits. You may have to review one, five, or more webpages in order to learn about all of the activities available to you, from campus tours to athletic events to programs for specific schools and majors. Also, you might also have to register in advance for these activities. Learn why college visit activities are important. We explain what an information session is, why students might want to meet with college professors or sit in on a class, and more. See which college visit activities are offered on each college’s website. 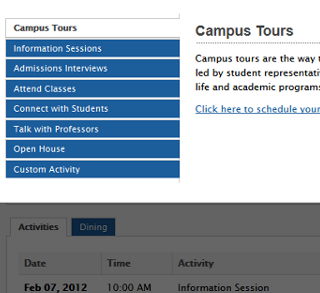 At a glance, you can view the type of experiences you can have on the campuses to which you will be traveling. Find the information you need. With a click, you will be able to get information about campus tours, information sessions, and other activities directly from the college’s website. #3: There are a Ton of Details to Track with College Visits. Why it’s a challenge: Before Go See Campus, a lot of families would plan college visits using pen and paper, Microsoft Word, or other note-taking systems. The problem is that college trip planning is fluid. Students and parents need to make changes to their plan up to the day they hit the road, and they may even alter their itinerary in the middle of a trip. Also, college visits are often collaborative. Students, parents, counselors, and consultants all may play a role in organizing a trip. Pen and paper do not lend themselves to editing, sharing, or connecting to outside resources. How Go See Campus Helps: Go See Campus’ College Trip Planner structures your visits in a way that lets you see where you will be and what you will be doing at every stage. You can edit details of your trip and update your itinerary immediately. Why it’s a challenge: Big road trips have a lot of stops, from hotels to restaurants to the college’s campus. When students and parents are flying from location to location, they need to know how to get from the airport to the university. GPS, you say? Well, we agree… to an extent. Global positioning systems are useful for driving directions, but 1) They do not always work when you need them and 2) They are not necessarily designed for college visits. Getting to the front gates of the school is only the beginning. You need directions to the parking lot, to the admissions hall or visitors center, and so on. 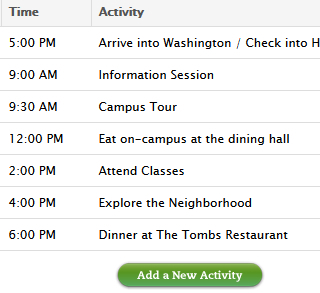 How Go See Campus Helps: The College Trip Planner integrates all of these resources for college visits. 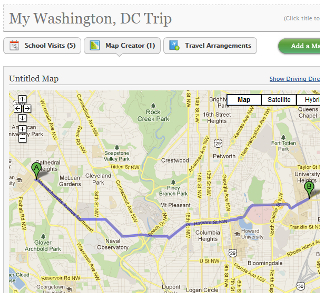 Point-to-point directions: Create and save maps that will guide you to and from campus or any other point of interest. Campus maps: With one click, access the university’s campus map so that you can find your way from one admissions activity to the next. Parking information and directions: Many colleges offer special instructions to visitors for traveling to and parking on campus. Find out what you need to know to get around traffic problems, construction sites, and other delays. Get started now with planning college visits and making the most of your college search! Are there other challenges you’d like to see addressed? Let us know!